This past AAR/SBL, Continuum Books and a special cadre of authors said a final farewell to our beloved editor, Frank Oveis, who has entered retirement after a prestigious career in publishing spanning over three decades. At the reception, wonderful anecdotes were shared and everyone was very grateful and proud to have worked with such a conscientious, knowledgeable, and skilled editor. It certainly was a wonderful, yet bittersweet reception. America Magazine, the National Catholic Weekly, has published a very kind tribute to Frank for all of his hard work and generosity over the years. 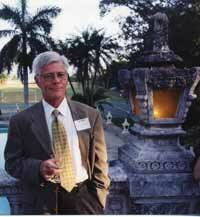 Despite all the technological changes in the business, he told Library Journal this past May that “publishing remains a highly personal affair, dependent upon the interests, education and intelligence of the acquiring editors.... I can’t say I develop books. Rather, I encourage certain authors.” Exactly. Having had only a short time to work with Frank before he left, I can say that it was a real pleasure to work with him especially as he was the only other religion editor in our New York office. He set a real example for me during my first few months and certainly made an impact for which I am very appreciative. I certainly share America's sentiment. All the best wishes on your next chapter, Frank! "Frederiek Depoortere offers the reader a challenging analysis of the fate of God in Western thinking. Whoever is troubled by the slogan "God is dead" will find here engaging information and thoughtful comments both on the history behind Nietzsche’s conclusion and on its implications for theology today." The Death of God is a fascinating study into the history of the western concept of the divine, tracing the roots of Nietzsche's outcry "God is dead!" as far back as to Greek philosophy. Frederiek is one of those incredibly prolific young scholars from the K U Leuven in Belgium, a place not only famous for its beautiful mediaeval town centre with the town hall and Begijnhoof and its beers (the home of Stella Artois! ), but also for the quality of research and scholarship of the theologians of Katholieke Universiteit Leuven. 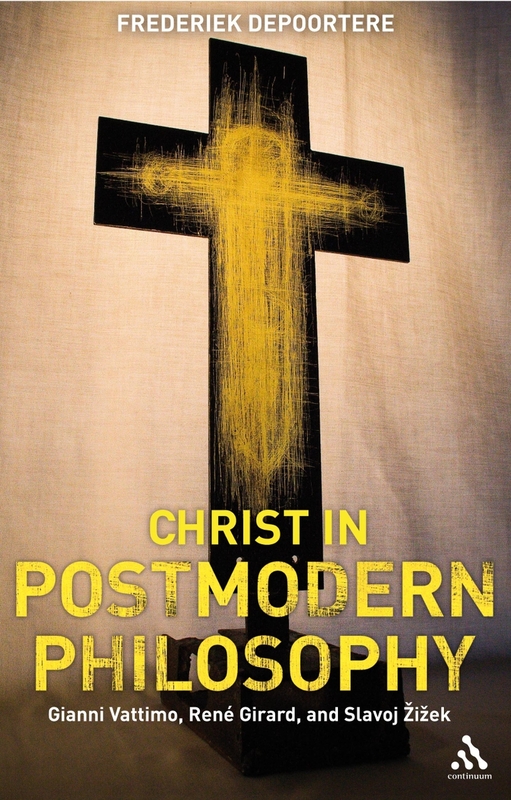 Frederiek is member of the Research Group Theology in a Postmodern Context, from which background his forthcoming book on Christ in Postmodern Philosphy will derive (due to be published later in 2008). I know, no one is ever going to offer us a serious manuscript after this. 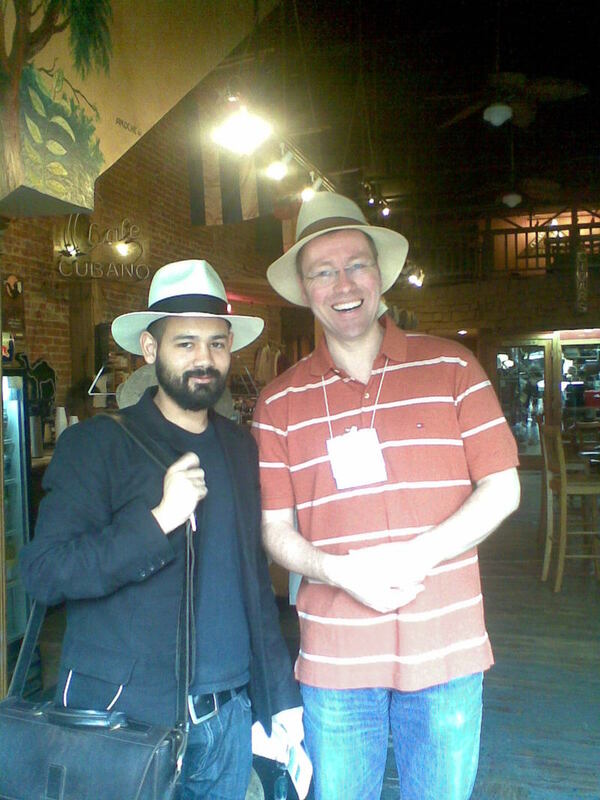 But we thought you might enjoy a photo of Haaris and Tom trying hats at San Diego. 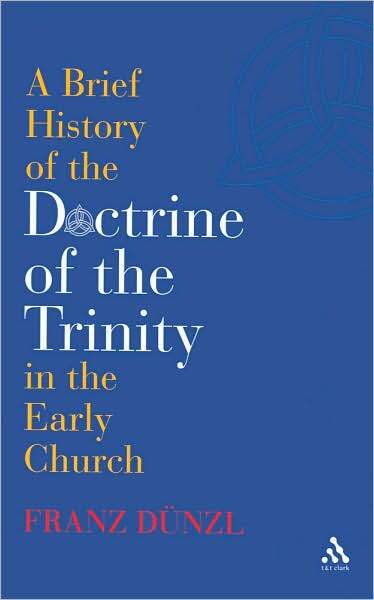 Nick Norelli has posted a wonderful multi-part review of Franz Dünzl's book A Brief History of the Doctrine of the Trinity in the Early Church (US customers please click here). The book is also available in German. In this short volume Dünzl certainly accomplished what he set out to do in providing readers with exactly what the title promises, a brief history of the doctrine of the Trinity in the early Church. This work is by no means exhaustive yet the reader will not feel the least bit slighted after having completed it, on the contrary, they will be hungry for more. Designed to serve as an introduction to more in-depth works such as R.P.C. Hanson’s The Search for the Christian Doctrine of God or Rowan Williams’ Arius: Heresy and Tradition, Dünzl provides us with an exciting recounting of the Nicene era of Church history. Written in a narrative style Dünzl doesn’t bore us with mere fact quoting nor does he bog us down with voluminous quotations from primary (or secondary) sources, but don’t let that discourage you, he still manages to handle the issues he speaks on responsibly and with attention to detail. When reading through this little book one senses that he definitely has the (lay)student in mind as nothing is overly technical (only key Greek, Latin, and Hebrew terms are used and they are always transliterated) and everything is easily retain-able (the narrative style helps to inductively instill the information rather than have to rely on rote memorization). This tiny work can (and should certainly) be used pedagogically. LHBOTS sounds like the latest in nanotechnology, but it's actually something far cooler, I think. The Library of Hebrew Bible/Old Testament Studies, formerly known as the Journal for the Study of the Old Testament Supplement Series (JSOTS) is part of T&T Clark's Library of Biblical Studies. Edited by Claudia Camp of Texas Christian University and Andrew Mein of Cambridge University, this 30 year-old series of almost 500 volumes offers the best in the field's cutting edge scholarship. New In Paperback! Vol. 393 Good Kings, Bad Kings: The Kingdom of Judah in the Seventh Century BCE by Lester L Grabbe is now available in the US and the UK. According to the Bible, among the last kings of the kingdom of Judah was one of the most notorious kings, Manasseh, and one of the most righteous, Josiah. Are the accounts of their contrasting reigns anything more than the ideological creations of pious writers and editors? Does this juxtaposition of a 'good king' and a 'bad king' provide good historical information or only theological wishful thinking? This carefully compiled volume from the European Seminar on Historical Methodology assesses the history of Judah in the seventh century BCE, covering history and archaeology from Sennacherib to Nebuchadnezzar. Contributions include fresh examinations of the reign of Josiah, questioning the nature of his famous cult reform, and even its historicity. Others present new insights into the portrayal of Manasseh and address the question of whether his reign is ripe for re-evaluation. With contributions from internationally known scholars such as Rainer Albertz, Philip Davies, Ernst Axel Knauf, this incisive collection presents an illuminating view of the depictions of kindship in the Hebrew Bible. Vol. 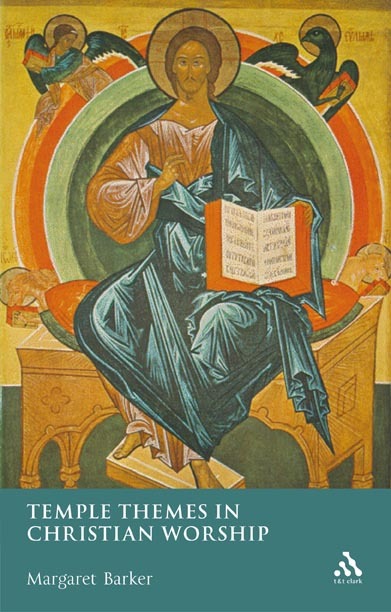 488 Diachronic and Synchronic: Reading the Psalms in Real Time: Proceedings from the Baylor Symposium on the Book of Psalms edited by Joel S. Burnett, W.H. Bellinger, Jr. and W. Dennis Tucker, Jr. This volume is the result of a symposium held at Baylor University in May of 2006, entitled “Baylor University Symposium on the Psalms.” The participants were carefully selected to represent the diversity of approaches currently employed in the study of the Psalter. Contributors include Walter Brueggeman, Erhard Gerstenberger, Peter W. Flint, and William P. Brown. Although a number of volumes in print offer the reader introductory information related to the Psalter, perhaps even noting various methodological approaches, very few actually “model” the diversity of such approaches. This volume exposes readers to the variety of approaches as practiced by leading scholars in the field. The volume is available in both the US and the UK. The studies in the volume deal with the changes that occurred in the Land of Israel during the Persian and early Hellenistic periods, from the 6th through the 4th centuries BCE. These are presented in three categories: archaeological, epigraphic and historical, though as a whole tend to be more interdisciplinary - as perhaps the material dictates. Most of them deal with either the province of Judah, Idumea or the interaction between the two, although a couple of them examine other parts of the country as well. A major focus of several of the contributions is the different aspects of the "Makkedah ostraca” and their possible meanings. The book is a substantial and well illustrated collection, featuring contributions from Diana Edelman, Hanan Eshel and Lisbeth Fried. It is available in the UK now and will publish in the US in January 2008. Thompson has shown that individual believers and groups of believers play a larger role in the narrative of Acts that has heretofore been recognized. His proposal that certain individuals are presented as typifying what it means to live as a believer or how to respond to the gospel and become a believer is helpful and moves discussion on. Luke’s portrait of the church, ultimately, is of a community marked as the people of God by the working of God that is seen in their care for one another’s needs, their oneness and unanimity, and their proclamation of the gospel, rather than by their ethnicity or conformity to the Torah (contra, at this point, Jervell). While this is hardly new, Thompson’s study has increased the depth and breadth of our understanding of the church in Acts significantly, and it identifies resources within Acts that readers—then and now—could use in considering their own construction of the church’s identity. The book as a whole is well-written, readable and clear, and remarkably free of typographical errors. The referencing is uniformly helpful in pointing to other resources that support or engage more fully with issues that Thompson considers, as well as in expanding or defending points made briefly in the main text. The book would make a useful textbook for a course or module on the church in Acts, as well as being of great value for study of the church in the New Testament more widely, assuming students have enough Greek to handle Thompson’s discussions. Further, it will stimulate and contribute helpfully to further scholarly discussion of the passages that the author considers. With Paul meeting the believers from Rome (Acts 28:15), we may thank God and take courage for the next steps of the journey in studying both the church and Acts. The book is available in both hardcover and paperback in the US and in the UK. We survived ETS and AAR/SBL 2007! WOW! We have finally returned from a great spree of conferencing. It was wonderful to see old friends and colleagues and to make some new ones. There was hardly a moment when people were not browsing the shelves and tables at the booth. We've got a few photos to put up when we have the chance. The entire T&T Clark team was very happy with the turnout and deem it a very successful AAR/SBL. We gave out our entire stock of T&T Clark totebags and most of our bookmarks advertising our blog. For those of you who are curious about next year's split, we will certainly be at both conferences in Chicago and Boston so there is nothing to worry about. First, we still have to recover from THIS year! 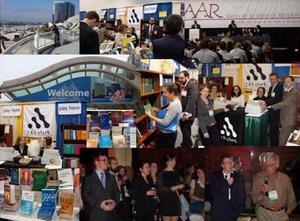 We were also at the Evangelical Theological Society's annual conference right before AAR/SBL. This is our second year at this conference and we were very pleased with the turnout of people who came by our booth. Everyone was happy to see that we had plenty of Barth, Gunton, and Torrence books in stock. If you discovered our blog at the conferences, welcome! Now that we're back in the office, we'll be sure to be posting a lot more frequently. We have a number of new releases to announce. Check back daily. In a cold, rainy London I have received wonderful news that AAR has been going splendidly. Tom, Haaris and Burke will certainly have a lot of blog posts to make following the trip. In the meantime, to whet your appetites, here is a photo montage showing the T&T Clark presence at the conference. Click for a pop up window with the full size image. With most of the editorial team now off to the AAR/SBL, I imagine it will be a moderately quiet week or so for the T&T Blog. Most of the readership is probably heading to San Diego anyway. However, for those of you not heading that way - or for those who have found a minute between papers and visits to the zoo - here is a glowing endorsement of Margaret Barker's new book from the Archbishop of Canterbury. "As always, Margaret Barker deploys a great range of scholarly equipment to invite us to rethink quite radically many of the conventional readings of the New Testament. Through a systematic study of biblical imagery, related to rabbinical and patristic interpretation, she makes it clear that the categories associated with the worship of Solomon’s Temple and with the person of the High Priest are central for understanding not only the earliest Christological language of the Church – an argument she has set out in other books – but also the nature of Christian sacramental practice.This is a book full of insight and challenge; some of its conclusions will be controversial, but it is a wonderfully learned and creative essay, drawing together much neglected or misunderstood material in a compelling new synthesis."